This Cornish hen recipe is infused with an herb bouquet and fresh citrus, then brushed with a sweet orange marmalade glaze—it’s a delicious, flavorful and beautiful departure from traditional roasted chicken. While a classic roasted chicken is easily one of my favorite “simple things”, I love taking an opportunity to prepare a bit of a special recipe in a similar style using the smaller, slightly more delicate and richly-flavorful little bird, the Cornish hen (or Cornish game hen). Cornish hens are typically only about one and a half to two pounds—small enough to enjoy one per person—and are the perfect bird to prepare for a bit of a special occasion meal, or whenever one feels like serving something eye-popping and just a little bit different. 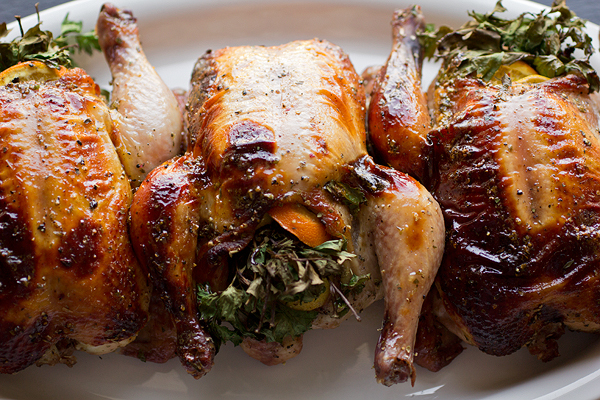 Roasted to a light golden-brown, Cornish hens are stunning when nestled together on a platter all glossy from a slightly sweet and delicious glaze, with fragrant herbs wildly sprouting out of their cavities along with slices of citrus. They make for a beautifully rustic meal that is not only an utter treat to eat but quite fun to prepare! And as lovely, succulent, and flavorful as Cornish hens are, they only require a good fistful of fragrant ingredients and a little bit of time to roast in the oven until golden-brown and perfectly juicy and moist. 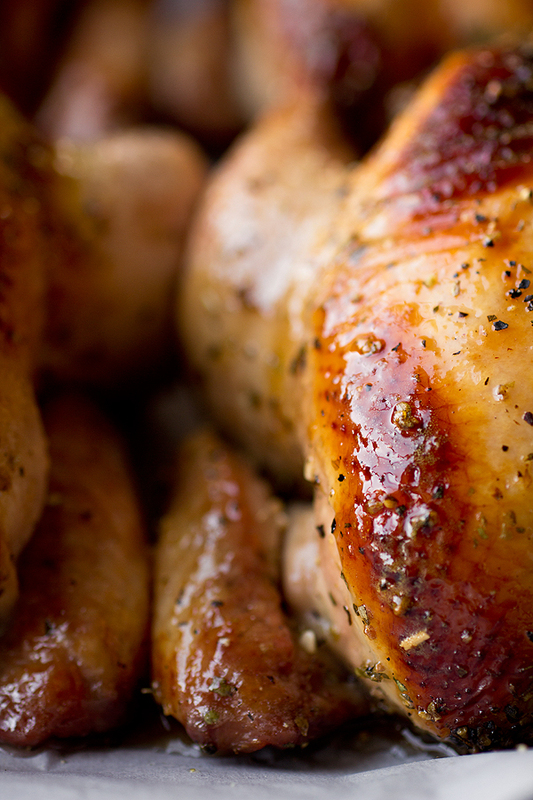 When it comes to cooking Cornish hens, roasting them in the oven is the best way to prepare them. You simply need some flavor pairings that will compliment the meat and bring out its natural flavor. My personal favorite ingredients to use in a scrumptious Cornish hen recipe are lots of aromatic herbs and citrus. The herbs—rosemary, parsley and thyme—provide that grassy, slightly “earthy” quality, and when stuffed inside for roasting, infuse the meat with spectacular flavor. I like to use slices of lemon and orange for the citrus, as these offer a mildly sweet note that compliments the herbs and gives the Cornish hens a really lovely fragrance, making it sort of “festive”! I also like to give them a bit of a glossy finish by creating a very simple orange marmalade glaze to brush on before and during the roasting process, made with only two ingredients: orange marmalade and a squeeze of fresh orange juice! The result is a Cornish hen that is tender, juicy and succulent… and if you’re like us, you’ll be licking your fingers afterwards! I begin by rinsing out my Cornish hens and patting them dry. I prepare my orange marmalade glaze by whisking together some orange marmalade with some fresh orange juice, and I set this aside. I preheat my oven to 375°, and prepare my baking sheet with some foil and a wire rack. I brush some of my glaze over each Cornish hen, then place them into the oven, breast-side up, to roast. After about twenty minutes, I brush a bit more glaze over the hens, then again once more after another twenty minutes. Then, I continue to roast for about another twenty to thirty minutes (for a total roasting time of about 1 hour – 1 hour 10 minutes), or until the Cornish hens are golden-brown and the internal temperature reaches 165°. I allow the hens to rest for about 10-15 minutes, then place onto a platter and serve! 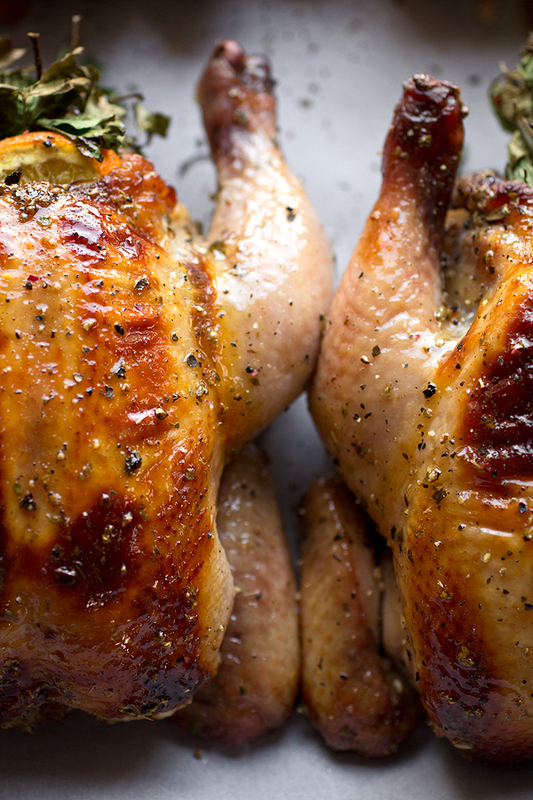 Fresh or frozen for this Cornish hen recipe: You can find Cornish hens in most markets. If you can find fresh, then purchase those; if you can only find frozen, then that is perfectly fine as well, just allow them to defrost in your fridge for a couple of days. Prep ahead for extra flavor: Whenever I prepare this Cornish hen recipe, I typically like to prep the hens about two days before I plan on roasting them. I will season them and stuff their cavities with the herbs and citrus slices, then place them a platter, then place the whole thing into a large ziplock bag to “marinate” and infuse for a 24-48 hours. You can also prep your glaze ahead too. A job for your digital thermometer: I like to use my digital thermometer when cooking anything that needs a specific internal temperature to ensure that it is safe to enjoy. Insert the probe into the thickest part of the thigh, and when the temp registers 165°, the chicken is cooked through, juicy, and safe to eat! Reheating leftovers: You can reheat Cornish hens in a toaster oven at 350° for about 10-15 minutes. Good sides to serve: Wild rice pilaf, potato and onion gratin, or greens are nice to serve with this recipe. Juicy and succulent, this Cornish hen recipe combines fragrant herbs and citrus, and is made glossy and slightly sweet from the orange marmalade glaze. -Begin by preparing your orange marmalade glaze: add the orange marmalade and the orange juice to a small pot set over medium-low heat, and stir to incorporate; once the mixture comes to the simmer, reduce the heat to low, and allow the mixture to simmer for about 10 minutes, until slightly reduced, stirring occasionally. -Once reduced, strain the mixture into a small bowl, and allow it to cool for about 20-25 minutes (it will also thicken up slightly) before using to glaze the hens. -To prepare the Cornish hens: preheat oven to 375° and line a baking sheet with foil, and place a wire rack onto the baking sheet. -Season the Cornish hens by liberally sprinkling salt both inside the cavities and outside the hens (about 1 tablespoons worth total), then sprinkling with freshly cracked black pepper and the Italian seasoning. -Next, prepare your herb bouquets by dividing the small bunch of flat-leaf parsley into 4 portions; then, add to the parsley about 4 sprigs of the fresh thyme, and 1 sprig of the fresh rosemary, and tie the herb bouquet into a little bundle with some string (I used simple sewing thread), just to help the bouquets to stay together. -Next, stuff one herb bouquet into the cavity of each hen, and then stuff 2 slices of lemon and 2 slices of orange into each cavity as well. -Place the hens on the wire rack, breast side up (I chose not to truss my hens, but you can if you prefer), and brush some of the orange marmalade glaze all over each hen, and place into the oven to roast on the lower-middle rack. -Once roasted, remove the hens from the oven, and allow them to rest for about 10-15 minutes; serve the hens with additional slices of fresh citrus for garnish, if you desire. Interested in more “roasted” recipes? 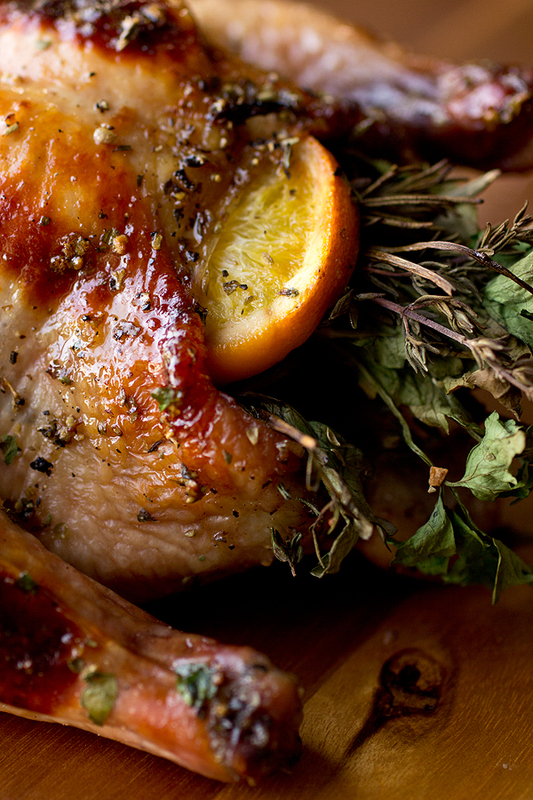 Check out this “Scarborough Fair” Roasted Chicken, or this Roasted Chicken with Autumn Veggies! These hens look absolutely stunning and I’m sure their taste matches! Since I still have oranges from the cranberry compote I will make this dish as well. Thanks for sharing. (The compote is cooling off right now, cant wait to taste it). Hi Anna, that plan sounds great – I think you’ll enjoy both dishes. (Funny enough, the cranberry compote would actually pair really nicely with these cornish game hens if you decided to have some together, come to think of it.) Enjoy! I am Anna’s husband. I just finished eating. WOW!!!! That was delicious. Hi Henrik! Can I tell you how awesome it is that a HUSBAND came back to comment on a recipe? You’re the first – I’m so excited about that! Thank you; I am truly so very happy that you enjoyed your meal. Please tell Anna “job well done” from me! Beautiful presentation. This is on our menu tonight. Thank you for sharing. Merry Christmas. Hi Kimberly, thank you! Have a Merry Christmas, and please enjoy your special meal! I just found this blog and made your recipe for our family’s Christmas dinner. It was wonderful; thank you so much! The hens smelled great while cooking and the glaze was terrific. It made the birds a beautiful deep honey color and the skin was so flavorful. Hi Sarah, that’s great! I’m thrilled to have had one of my recipes be a part of your Christmas dinner – thank you for sharing that with me! Hi Gary, thank you for your comments. I know this post is a couple years old, but I found this recipe through Pinterest recently and tried it out on my boyfriend this past weekend. I just have to say, THANK YOU! Not only was my dinner visually beautiful (the hens were cooked to golden perfection! ), they were tasty and juicy and flavorful. My bf was thoroughly impressed and it was the perfect late-October dinner for a cozy Saturday night in. Erin, I was so tickled when I read your comment—I absolutely love that! I’m so excited that this recipe turned out to be everything you wanted for a dinner in, and I’m thoroughly warmed when I imagine the two of you all cozied up over a home-cooked, from-the-heart meal! Thanks so much for sharing that with me; it truly means a lot. This was the most amazing piece of meat I’ve tasted in a while! My family LOVED it (they’re begging that I make it again soon) and the instructions were very easy to follow. Thank you so much for this wonderful recipe. 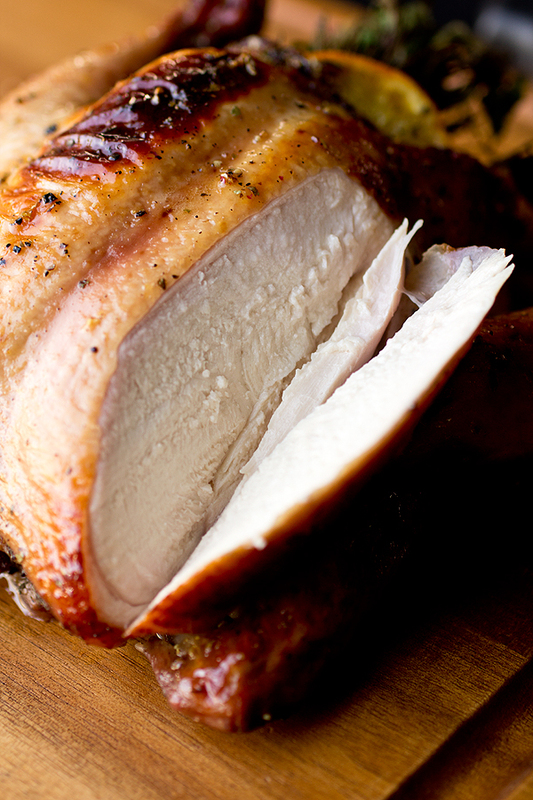 This recipe is one of the best poultry recipes I have tried in a long time. The herbs combined with the carmelized orange marmalade is the perfect combination of flavors. I can’t wait to make it for company. I am sure they will be just as impressed with the taste as I was. Thank you for sharing such a great recipe. Brenda, thanks so much for sharing your experience with the recipe with me! I’m thrilled that you enjoyed this, and plan on sharing it with guests! I am thinking of using this recipe for a Halloween Supper Club. Can you think of any twist on the recipe that will make it feel more “Halloweeny”? Also, when you say strain the mixture, do you mean with a small collander, or with a more fine mesh like a tea strainer? Hi Tamara, use more of a fine mesh strainer, as a colander would be too big. Just something to allow the liquid to pass through and give it a silkier, glossy texture. And as far as making it more Halloween-y, hmm….not sure about in the actual recipe, but you could totally decorate around the birds in a fun way. Perhaps some tiny little pumpkins, maybe carved out; something surrounding the quails, like creepy little thin twigs, kind of gnarled up, on the platter. (??) 🙂 I’d love to know what you end up doing! I am about to prepare this recipe tomorrow for Christmas Eve. I have one question about a step I am unclear on. Should I glaze the hen and let it sit over night or wait to glaze before I cook it? You said you prepared your hen early, but didn’t specify if you used the glaze then too!! Hi Kristen! No, I didn’t glaze ahead of time—I only seasoned and stuffed them. I glazed just before placing into the oven. 🙂 I’m excited your trying these out for Christmas Eve! How wonderful! I hope you and your loved ones enjoy—happy cooking, and Merry Christmas! Thrilled to read that—thank you for sharing your experience! I can’t wait to make this for a dinner party!!! How can this recipe be modified for halved Cornish hens? Hi Kesia, you can still glaze them/roast them as per the recipe, but instead of stuffing the herbs inside of them, now you could lay the halves on top of the little bundle of herbs and citrus slices for some aroma to carry into the meat. To be sure of the doneness, you should still use a thermometer inserted into one of the halves, into the thickest part of it, rather than guessing; that way they won’t be overcooked or undercooked, as it’s a bit tough for me to give you proper time on these. Awesome! Thank you so much for the advice and responding so quickly! Happy Holidays! My pleasure, Kesia! Happy holidays to you too! Absolutely fabulous – very juicy and just delicious. I had a few marinated lemons – so I used them as well as the oranges – it was a hit! Hi Kristine, thanks so much for taking a moment to come back and share your experience with me! I’m thrilled you enjoyed the recipe, and the addition of the marinated lemons sounds exquisite. I’m thinking of making these on Sunday for a large family dinner – 5 adults 5 kids ages 6-13. I have a double oven sort of I have a typical lower oven and then a think upper oven. I might be able to get 5 on two cookie sheets so they can both go in the lower oven. If not I might have to do at least a couple in the upper oven too. Your recipe says to put the rack in the lower part of the oven. Do you think I’ll be ok with my plan? Also – am I crazy?! If I can be candid with you, yes, you are crazy. 😉 Honestly, I don’t know I’d recommend you doing this particular recipe for this many people if you’re unsure about oven space. And since you have so many kids, the Cornish hens will most likely be a bit too big for them. I can’t imagine the kids eating a whole hen, especially the younger ones. Much love to you, Laura! And hey, if you do decide to be bold and prepare these, let me know how it goes!! But I’d love for you to enjoy your guests as much as possible without worrying over dinner. I have a question. Do you think this would be enough food to serve six adults and two kids? We will have loads of sides and I was thinking each person would get half a chicken. Thanks so much! Hi Jessica, I sure do. I think with amount of food/sides you’re planning on serving, the half of a hen per person should be perfect. Amber, I am so incredibly touched by your comment, and the enthusiasm in it! I’m very excited you’re planning on preparing this tasty recipe, and trying something new; but I’m even more excited and impressed that you are treating yourself to something special. Sometimes what’s needed is having “no one to impress” but yourself, and this meal (and the experience it brings with it) is your gift to yourself. I truly, truly hope you enjoy the cooking process, and are nourished and warmed by the results…have a wonderful and cozy Christmas, Amber! 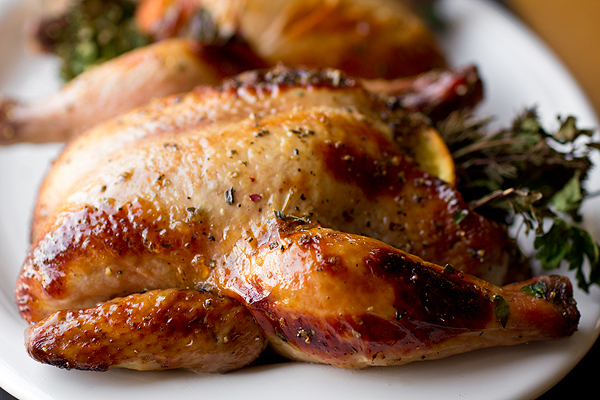 Can this recipe be used for a whole chicken rather than Cornish hens? My daughter and I never had or made Cornish Hens before. They turned out so tasty and juicy and we had fun making them. Thank you so much for sharing your delicious recipe. Even my cat thanks you. He was quite adamant I share with him. Hi Susan, I’m am so touched and happy that you and your daughter enjoyed the recipe! Having fun while preparing a meal is so important, and it seems like the two of you have great partners in one another. Also happy the kitty enjoyed a bite or two, haha! 😉 Thanks for sharing.